"I would recommend Dane and Eckard Flooring to anyone looking for a trustworthy contractor." Did you know that different tile manufacturing companies use materials such as clay, metal and quartz to manufacture floor tiles? Everybody has defined personal characteristics and values, and so does every type of flooring. This has driven most tile manufacturers to the edge of innovation in a bid to meet the rising needs of the flooring market. 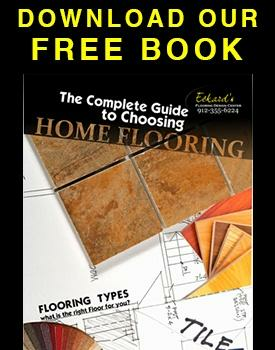 The most common and increasingly dominant types of tile flooring include those designed from ceramics and natural stone. The main ingredient of the ceramic tile is quarried clay. The clay is specifically prepared and hardened by the use of the necessary chemicals to guarantee its durability. Extreme pressure and heat are used to extrude, mold and incorporate the dry material in the clay cocktail. The formation of extruded ceramic tiles is ensured through the mixture and the integration of the wet materials into the mold. The hardening of the very wet composite material in a mold kiln under extreme temperatures leads to the formation of a slush mold, which is then used for ceramic tile making. Non-porcelain tile is more traditional. They are made from a white and brown clay mixture with other minerals. The difference between the porcelain and the non-porcelain tile is that feldspar, a white dust, makes up 50% of the porcelain ceramic tiles. Feldspar bonds all the molded clay ingredients together, hardening the tile for extra strength and durability. Because of this, the porcelain ceramic tiles cost more at the tile shop than the non-porcelain variety. The distinctive ceramic tile characteristics can be created through varying the percentage of content composition and through slight changes to the manufacturing process. The porcelain tiles are fit for use as bathroom tiles and kitchen floor tiles. Natural stone tile varieties are produced from the naturally setting and readily available materials quarried from mines. To make the final finishing, the stone is cut to size and smoothened. Granite: They are hard and quite tense rocks that come in varied colors due to its speckle mineral composition. Naturally, granite is impervious and resists scratching after polishing. This earns it the best kitchen and bathroom flooring reputation. Marble: Marble is a metamorphic veined rock that comes in different colors. It is highly porous; hence it should not be installed as a bathroom tile. Limestone: Limestone is a sedimentary rock. It has a lower density and absorbs stains, which means it requires regular cleaning. The stone tile can also get scratched easily, unlike marble or granite. Travertine Tile: Travertine Tile is made from travertine, a type of limestone with a crystal appearance. Because it is porous, polishing a travertine tile is completed by filling up the voids on its surface. Like limestone, you should not install travertine tiles as kitchen or bathroom flooring. Slate: Slate is metamorphous. It is known for its extreme density and durability. Mostly, slate is dull in color. The slate tiles need no artificial texturing. Manufacturers polish the surface to improve the appearance. For high traffic area and kitchens, choose slate tiles. Visit our tile shops today to get advice and recommendations on the best tile choice for your home.